While trying to limit carbs, I’m also trying to improve taste. That’s not easy being on a gluten-free, vegetarian, mostly dairy-free diet. Making that low carb can put a crimp in what’s left to eat. But I’m learning to adapt. 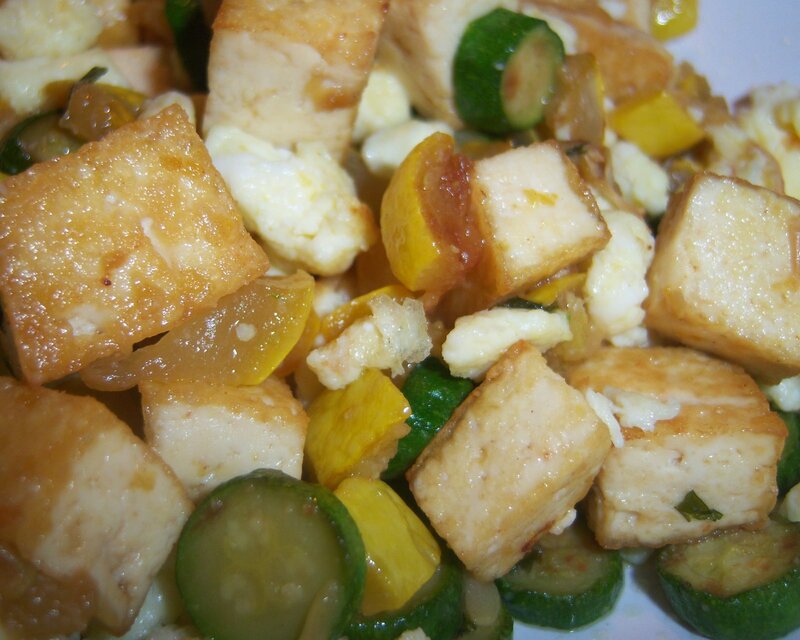 Last night I decided to stir fry up some tofu and some beautiful baby zucchini from Trader Joe’s. Yum. My daughter decided she wanted fried rice, so we combined the two for a wonderful two-way dinner. Using a little nutritional yeast is the key. It gives flavor and crispiness to the tofu. Don’t be afraid of it, I had never heard of it before last year and I was pretty nervous about trying it, but it’s really great. I found it in the bulk section of Whole Foods. You only need a small handful to last a long time. Take about one cup of cubed firm tofu, drained and pressed to get out most of the liquid. Let that sit and drain while cutting the baby zucchini and yellow squash in small pieces. Stir fry squash and zucchini in a little olive oil and wheat-free tamari. Add a few tablespoons of water to steam after a few moments, then let them brown for a moment. Take out zucchini, add olive oil to the pan and add tofu (I like to add a little butter also, it helps to brown the tofu). Sprinkle tofu with about 1 teaspoon of nutritional yeast. Stir fry until tofu gets crispy and browned on all sides. It doesn’t take long, shake the pan often to loosen tofu and brown it. When tofu is done, add zucchini to the pan. At this point, I add a little garlic and salt and I’m good to go. Daughter wanted her rice, so to the pan (after I had taken my half out) we added two scrambled egg whites (or whole eggs) cooked earlier and broken into small pieces and one and a half cups of jasmine rice, precooked (Trader Joe’s). Stir fry this for a few moments, adding a little more tamari and a small splash of sesame oil. Either way, it’s beautiful. Without the rice, this is a high-protein meal with low carbs. 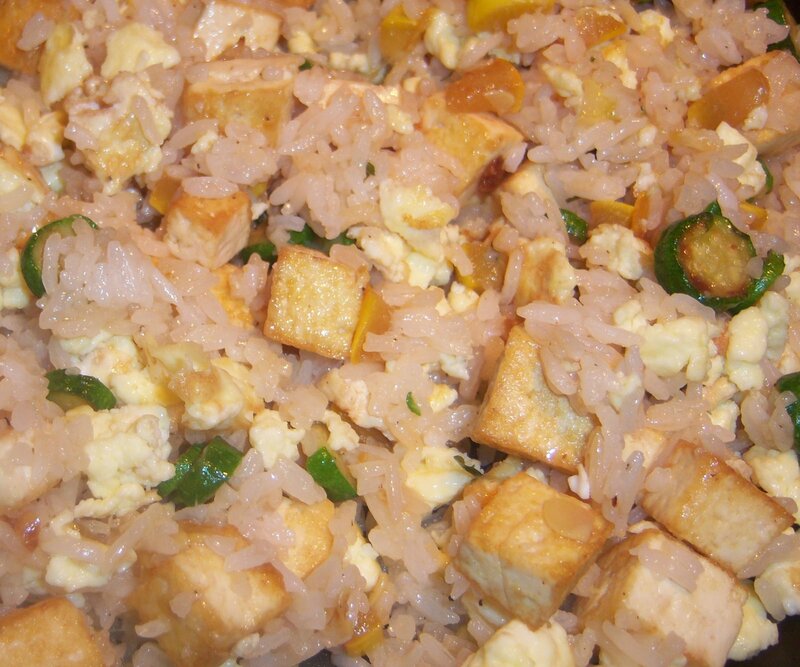 You can also add the eggs in with the tofu and zucchini for an even bigger protein boost. With the rice, it’s a great, filling meal with lots of protein and veggies.